Posh winger Jon Taylor takes on the Millwall defence. Photo: Joe Dent/theposh.com. The next Peterborough United match is live on television. And on the evidence of last night’s (September 1) Johnstone’s Paint Trophy defeat at MIllwall, Posh fans will be watching the game from behind the sofa. Posh striker Kyle Vassell tries to get the ball off Milwall defender Carlos Edwards. Photo: Joe Dent/theposh.com. Posh looked pretty in pink, but nothing else about their performance at the New Den pleased the senses. Indeed manager Dave Robertson’s post-match press conference suggested he thought his team stank the place out. Robertson was presumably angry that Posh finally went down to a 92nd-minute free header. He might also be concerned that the failure to improve both the performances and the results fairly quickly will bring an itch to Darragh MacAnthony’s trigger finger. The chairman, who is understood to be flying back to the United States today (September 2), likes winning and he likes entertaining football, but he is getting neither at the moment. Certainly Robertson’s press conferences are starting to resemble the ones his predecessor used to conduct towards the end of his reign at the ABAX Stadium. Asking players to self-motivate as Robertson did a couple of weeks ago and then refusing to defend another poor performance, as he did last night, are worryingly familiar. Of course the fact that Robertson is not a natural media performer shouldn’t be held against him. Nor should a terrible run of defensive injuries - Posh played the last 25 minutes last night with the entire back four arguably playing out of position - but Posh could have signed John Terry on deadline day and they wouldn’t solve what is likely to remain their biggest headache this season. The loan transfer window opens in a week and if Posh don’t sign a striker capable of scoring or creating goals they could be condemned to a season-long struggle. They remain reliant on Marcus Maddison (a player not renowned for his reliability) for their attacking threat, but even the best players struggle to pop goals in from 25 yards every week. Maddison played okay again last night without ever looking like the £2 million player pre-deadline day hype suggested, but he must be irritated that his improved crossing and passing is yielding little reward. Posh did introduce a goal-scoring midfielder at Millwall in young Irishman Chris Forrester. He started in central midfield and his performance mirrored the team’s - he was bright and inventive for the opening quarter before becoming less effective and sloppy. Milwall had lost every home game this season - they had won just one of their last 21 competitive matches at the New Den - while Posh had lost every away game so the fact that the first-half was dire, once a bright start from the visitors had fizzled out, came as no surprise. Forrester’s self-belief was evident in a second-minute 40-yard strike at goal in an attempt to take advantage of home ‘keeper Jordan Archer’s absence from his area. He also buzzed around promisingly, demanding the ball and generally using it wisely. He is worth persevering with, but the same cannot be said of any Posh forward. Conor Washington and Kyle Vassell started again last night and saw enough of the ball to justify their inclusion. Lee Angol again sat on the substitutes’ bench as Posh declined the opportunity to see if he can transfer his free-scoring Boreham Wood form to matches of League One standard. Washington is still raw, but he is apparently the main striker at the club. His chairman and manager believe he can score 20 goals in a season and some of his approach play last night was pretty decent. He took one difficult through ball down at the start of the second half quite brilliantly and promptly streaked clear of the home defence. His subsequent 16-yard shot had power, but not enough accuracy as Archer blocked comfortably. Washington was almost through on goal in the opening exchanges, but dithered and was caught. Vassell’s contribution was limited to a caution and a fine pull-back that substitute Harry Beautyman, after making a lung-bursting run up in support, slapped disappointingly wide of the target. Beautyman was a 20th-minute arrival after centre-back Alex Davey left the pitch feeling unwell. He was deployed at right-back even though Michael Smith, a specialist in that position, was on the substitutes’ bench - Robertson didn’t believe he was fit enough to play 70 minutes. Beautyman performed okay, but Posh suffered more when Ricardo Santos, an imposing figure for an hour, was forced off with a facial injury midway through the second-half. Callum Elder was moved inside from left-back, Smith, who was making his first appearamce of the season after recovering form a back injury, played at left-back so disorientation was perhaps inevitable. Millwall found more time and space to play in the final quarter and it wasn’t the greatest surprise when Shaun Williams arrived unmarked at the start of injury time to head in a right-wing cross from Carlos Edwards. a goal that was harsh on Posh ‘keeper Ben Alwnick who had made two outstanding second-half saves. Ed Upson was his victim on both occasion. Alnwick stretched to finger-tip his low shot away and then stormed off his line impressively after the Millwall midfielder had danced his way through what was now a very brittle back four. Mark Beevers also headed against the top of the bar as Posh started to labour. Posh had their moments after the break, even if their manager’s post-match claim of 14-15 chances may have included the pre-match warm-up, but failed to make them count. Jermaine Anderson, given the night off by England Under 20s, hooked one volley over the bar, while Maddison’s burst inside a full-back was ruined by a weak shot. Anderson should have scored midway through the first-half after accepting Maddison’s pass and slipping past his marker in the area, but he missed the ball completely when attempting to shoot. 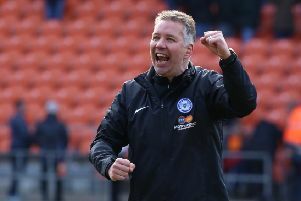 Posh won this competition after a memorable Wembley victory in the final in 2014, but have now been dumped out at the first round stage in the last two seasons. That final was screened live on television. It was the last time Posh won in front of the cameras - a run that might well continue at Roots Hall on Saturday (September 5) unless the manager can prompt some dramatic improvement. Posh: Ben Alnwick, Michael Bostwick, Ricardo Santos (sub Michael Smith, 65 mins), Alex Davey (sub Harry Beautyman, 20 mins), Callum Elder, Jon Taylor, Jermaine Anderson, Chris Forrester, Marcus Maddison, Kyle Vassell (sub Souleymane Coulibaly, 75 mins), Conor Washington. Unused substitutes: Dion-Curtis Henry, Lee Angol. Millwall: Jordan Archer, Carlos Edwards, Sid Nelson, Mark Beevers, Tony Craig, Fred Onyadimna (sub Byron Webster, 90 mins), Ben Thompson, Shaun Williams, Ed Upson, Aiden O’Brien (sub Paris Cowan-Hall, 81 mins), John Marquis (sub Lee Gregory, 69 mins). Unused substitutes: Harry Girling, Shaun Cummings. Goals: Millwall - Williams (90 + 2 mins). Cautions: Posh - Vassell (foul), Bostwick (foul). Millwall - Beevers (foul), Williams (foul), Nelson (foul).